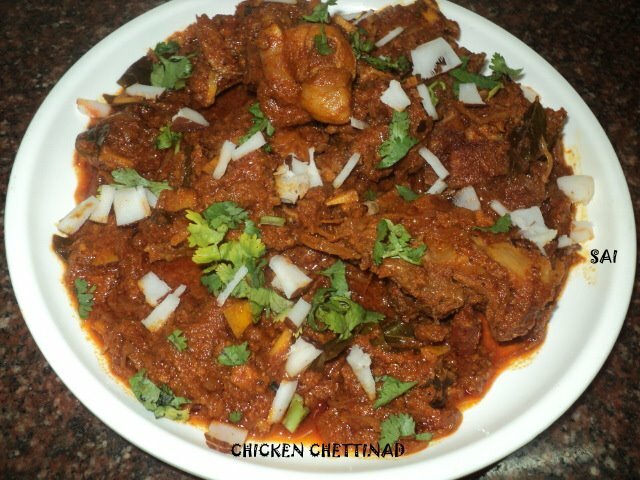 This is the second recipe of ‘Chicken Chettinad’ in the space which is almost similar to Kudupi maam’s recipe which I had shared yesterday. I’ve been following this recipe since many years. This is the recipe of Sanjeev Kapoor which we modified slightly. I found this picture in one of my old folder. Even the slight change in the recipe enhances the taste of the dish. In this recipe the taste is enhanced with the flavor of curry leaves and crunchy coconut bits. This recipe is a keeper. Dry roast coconut until brown and keep it aside. Roast chillies and all the dry ingredients mentioned under the same in 2 tsp oil. Coarsely grind all the fried ingredients along with the coconut,ginger and garlic . Heat oil or ghee in a pan and fry onions until brown,add curry leaves,ground paste, tomatoes,chilly powder,turmeric powder and saute for sometime in simmer . Add chicken pieces,coconut pieces and mix,add little water,keep in high flame for sometime,it will release water,if it looks dry add little water,then simmer and cook until done. Lastly add lemon juice and garnish with chopped coriander leaves.